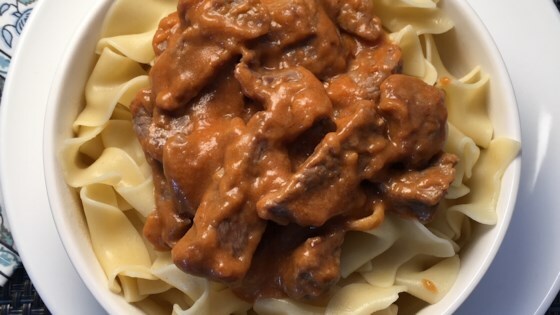 "This is an authentic Russian beef stroganoff recipe made with sour cream (in Russia we use smetana) and without mushrooms. It is very simple, but this is the original version. You can of course add onions as well if you like, but a lot of Russian recipes are quite basic. Serve over pasta or rice." Place flour in a bowl. Toss beef strips in flour until coated on all sides. Heat oil in a large skillet over medium-high heat. Saute streak strips in the hot oil until browned, 3 to 5 minutes. Add sour cream, tomato paste, salt, and pepper; stir to combine. Add some water if mixture is too thick. Cover and simmer over low heat until meat is cooked through and soft, 20 to 25 minutes. Depending on the cut and quality of the meat, the cooking time can be significantly longer, up to 1 hour, if the meat is very tough.